$369 8 minute capacity. You Choose ! Let us create a Custom Complete On Hold Production for you and take another $10 off of the above prices! 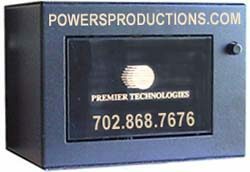 Premier Technologies HiFi 3100 Series -- HiFi3100 Series Discounted $329-4min / $369-8min or when purchased with our Message On Hold Production $319-4min / $359-8min. The "High Fidelity" ADL3100 has crystal clear quality with an improved digitizing method of µlaw (mu-law), unlike any other in the industry (with the same look as the older ADL3000 & ADL 3100 Series). Sampling rate is an astounding 112kbps! Just insert your prerecorded cassette, close the door, and the unit automatically loads ("load once") audio to its internal digital memory (voice prompting included). Storing messages digitally limits mechanical breakdowns that may be experienced with other analog equipment. To guarantee a perfect download, the HiFi 3100 uses the highest quality tape drive in the industry. The drive is built to accompany high end stereo equipment, not the lower quality tape drives found in answering machines. The unit loads your customized on hold program on speed every time. Two output jacks provide the industry standard 600 ohm and a very impressive 5 Watt output at the 8 ohm jack. The new tone control gives you a broader range of sound, thus allowing the bass and treble to maximize the 3100s fidelity. If power to the unit should ever be interrupted, the HiFi 3100 retains any recorded audio in its built-in memory. You merely open the cassette door, insert your cassette, close the door, and walk away. The HiFi ADL 3100(ADL 3104 / ADL 3108) automatically assesses the audio start and stop points, sets the record levels, downloads, and goes into play mode. This translates into no need for adjustments of any kind, other than setting the output volume into your phone system one time. For the on-hold professional, microprocessor control means fewer callbacks, smoother installations at the end-user site, and more satisfied customers. Changing messages is as easy as inserting a new tape. When the HiFi 3100 downloads the new tape program, it automatically erases the previous program. The HiFi 3100 is compatible with any telephone system that has a Music/Message On Hold interface or Music/Message Audio Input, as well as any Point Of Purchase Displays.